According to Patapaa, Queen Peezy originally called Gabriella Kotey just needed hype and so all he did was help her to achieve that. The ‘One Corner’ hitmaker also refuted claims that he purchased a promise ring for Queen Peezy. He stated that he is aware of nothing about the ring and that she bought it herself. “Gabby came as a hype. a friend introduced her to me and told me that she is a model who desires to be associated with me for hype. 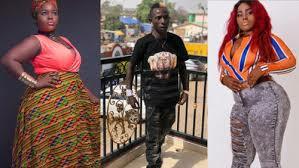 According to Patapaa, he was really surprised when he saw the viral video of Queen Peezy crying because there’s nothing occurring between them. This revelation by Patapaa comes after news bust out that he has found a new girlfriend in germany wherever he was on a tour. In a video that went viral, Patapaa was seen kissing a white woman purported to be his girlfriend which came as a surprise to ghanaians because it’s known that he has a girlfriend in Ghana called Queen Peezy.